Seville Orange Marmalade for sale. Buy online at Zingerman's Mail Order. Gourmet Gifts. Food Gifts. Robert Lambert is many things: a fruit encyclopedia, a meticulous preserve maker, a perfectionist, and a thousand other adjectives, but one thing he's NOT is cheap. Other producers order fruit from a distributor, Robert picks his own. Others use water in their recipes, Robert juices the fruit himself and uses that instead of water. Others haphazardly toss chopped up peels into their recipes, Robert candies them first. Like I said: obsessive and meticulous. For this marmalade--Robert's biggest seller--he mixes bergamot and a bit of Meyer lemon in to balance the sourness of the Seville oranges. 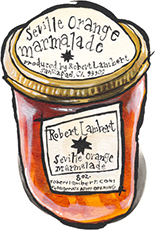 Where as other marmalades made by less diligent producers are some combination of too sweet and too bitter, Robert's marmalade comes across as bright, fresh tasting, clean, and bursting with citrus. Even your grandmother would say Robert takes things a little too far.